The first fronds of dill are doing their delicate dance in my garden. I’m still waiting impatiently for everything else to start sprouting seriously, and my pantry is running bare of last summer’s pesto and jam. So here’s a recipe for the in-between days, with just a dash of freshness from the garden. Rinse the lentils and set aside to drain. Heat the olive oil in a large pot, add onions and sauté until translucent. Add carrots, garlic, salte, pepper, chili flakes, rosemary, oregano and bay leaves. Stir well and sauté until the carrots are tender. Add the stock and the lentils and bring to a boil. Reduce the heat and summer for about 25 minutes or until the lentils are sfot. Remove the bay leaves. You may puree the soup at this point or just leave it as is. Add the lemon juice, zest and more salt and pepper to taste. To serve, ladle the soup into bowls and sprinkle with feta and dill on top. 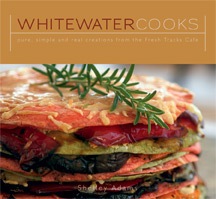 From Whitewater Cooks: Pure, Simple and Real.